In 2004, David Goodhart wrote an essay called ‘Too Diverse?’ in Prospect magazine, of which he was then editor. Liberals, he suggested, had to face up to a ‘progressive dilemma’. Too much immigration undermined social solidarity, particularly in a welfare state. We had to choose between the two. The essay caused considerable controversy, but became a key point of reference for many communitarian thinkers, both Labour and Conservative. Goodhart, now director of the centre-left think tank Demos, has developed that essay into a book. 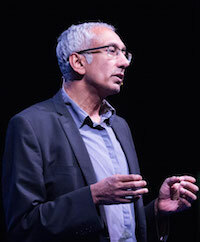 At the heart of The British Dream are three key themes: first, the chasm between the elite and the public on the issue of immigration; second, the corrosive effect of immigration on community solidarity and traditional identities; and third, the problems caused by what Goodhart calls ‘laissez faire multiculturalism’. Goodhart touches here on some of the critical issues that we face today. The trouble is, his insistence on seeing contemporary problems primarily through the lens of immigration only obscures those issues and makes it more difficult to formulate adequate responses. Since the 1960s, Goodhart suggests, the public, faced with the reality, have become increasingly hostile to mass immigration. The political class, driven by abstract universalist ideas, has continued to see it as a good. This has led to the perception of an elite out of touch with the views and needs of ordinary people, a perception that has helped fuel the rise of populist groups, such as UKIP. There is clearly a germ of truth in this argument. Yet both the cause of the gap, and the attitudes of the elite towards immigration, is far more complex than Goodhart allows. Far from being driven by a universalist impulse, the political class, initially at least, moved in the opposite direction. In 1960 the Labour Party opposed, on high moral grounds, Conservative plans for the first postwar immigration controls. Eight years later, the Labour government introduced perhaps the most openly racist piece of legislation in postwar history, the 1968 Immigration Act, whose sole aim was to prevent Kenyan Asians from entering Britain. ‘The Labour Party’, the Times suggested, ‘has a new ideology. It does not any longer profess to believe in the equality of man. It does not even believe in the equality of British citizens. It believes in the equality of white British citizens’. Even Auberon Waugh described the Act as ‘one of the most immoral pieces of legislation to have emerged from any British parliament’. Labour’s shift was symbolic of how the political class had come to view immigration. From Labour’s infamous ‘virginity tests’ of the 1970s, in which young brides from the Indian subcontinent were subject to humiliation to ensure they were ‘genuine’, to Margaret Thatcher raising the spectre, in a 1978 TV interview, of Britain being ‘swamped by people with a different culture’, the attitudes of the elite and the realities of immigration policy were very different from the story that Goodhart tells. It is true that by the Noughties much had changed. There was now a broad acceptance of racial equality and a greater openness to immigration in certain government circles. Up to the mid-1990s, Goodhart observes, net immigration was close to zero. Since 2004, more people have arrived each year than in the whole period from 1066 to 1950, Yet, even as the Treasury pushed the idea of greater immigration as an economic good, the Home Office continued to project the image of immigration as a social problem requiring tighter control. Asylum seekers in particular became the target of mean-spirited and demeaning policy. What developed at the same time was a certain elite contempt for the views of working class voters, and the perception that such voters were often driven by racism, a perception symbolized by Gordon Brown’s infamous dismissal of pensioner Gillian Duffy as a ‘bigot’ during the 2010 election. This, however, had less to do with elite attitudes to immigration than with the disconnection of the public from the political process. 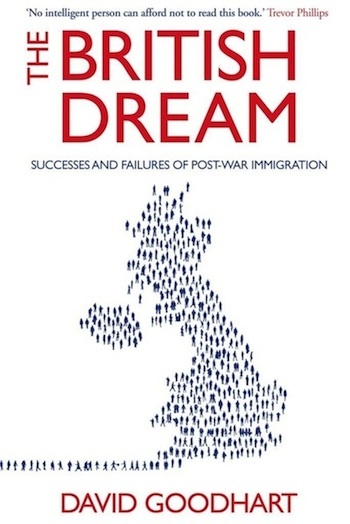 We can see this in the second of Goodhart’s key themes: the impact of immigration in disrupting communities, eroding traditional identities, and transforming the cultural landscape, creating an England ‘increasingly full of mysterious and unfamiliar worlds’. Virtually every wave of immigration has been met with similar fears and anxieties. What is different today is that there really has been a transformation in working class life and culture. 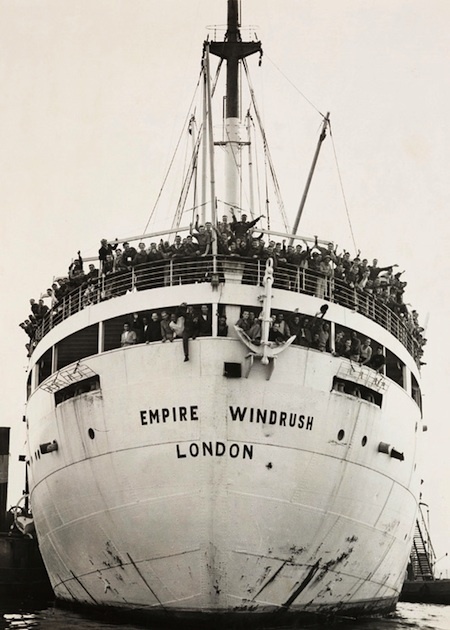 The first postwar immigrants arrived during what Goodhart calls the ‘Golden age of working class Britain’, a period of rising wages, full employment, an expanding welfare state and a sense of working class power. By the time of the new wave of immigration at the beginning of this century, that landscape had been transformed. Britain’s manufacturing base had disappeared, working class communities torn apart, and the welfare state had begun to crumble. Trade unions had been neutered, and the Labour party had largely cut its roots with its working class base. Many sections of the working class felt voiceless and detached from the political process. These changes helped create that gap between the masses and the elite that rightly worries Goodhart. Immigration played almost no part in fostering these changes. Immigrants became, however, symbolic of the shift. Why? Because of the way that the public discussion of immigration has been framed, with immigrants presented from the beginning as a problem, even a threat. Almost inevitably, working class voters came to view their problems through the lens of immigration. And because they did so, the liberal elite could often dismiss their concerns as merely an expression of racism, allowing the political class to ignore legitimate problems, thereby further exacerbating the gap between the public and the elite. There are real problems that need to be addressed with the growth of minority communities in Britain. These, however, have arisen not from immigration as such but from the attempts to manage diversity. And this takes us to the third of Goodhart’s themes: the difficulties created by multicultural policies. Goodhart distinguishes between what he calls ‘liberal’ and ‘separatist’ multicultural policies. Liberal multiculturalism, which Goodhart sees as official policy in the 60s and 70s, amounts to ‘colour blind equality’. It failed because the authorities failed to tackle racism. It was replaced in the 80s by ‘separatist’ multiculturalism, which ‘privileges minority identities over common citizenship’, ‘wants to positively promote and fund ethnic difference’ and regards society as a ‘community of communities’. I agree with much of the argument. I, too, have long been a critic of multiculturalism, and Goodhart generously quotes me in his book. And yet, his critique is different to mine. I am hostile to multiculturalism not because I worry about immigration but because I welcome it. The lived experience of diversity is something to celebrate. The problem has been the attempt the authorities to manage that diversity through multicultural policies by putting people into ethnic and cultural boxes, defining individual needs and rights by virtue of the boxes into which people are put, and using those boxes to shape public policy. The results have been disastrous, sidelining progressive movements within minority communities and giving new legitimacy to conservative, often religious, figures. Goodhart accepts much of this, and indeed relates part of this story in his book. Yet, because he sees the issue primarily as one of immigration, he falls back on the argument that the real problem stems from the values and behaviours of certain, particularly Muslim, communities. That is to ignore his own observation that what he calls ‘separatist’ multicultural policy ‘preserves in aspic the patterns of life of the first immigration generation, making some British South Asian communities seem laughably old-fashioned to their actual South Asian cousins’. The real issue, in other words, is not immigration, but the policies enacted to manage diversity. And the real problem is not that government policy has been too laissez faire, as Goodhart suggests, but that it has been too cackhandedly interventionist. For some, Goodhart’s argument about immigration is brave and necessary. For others it is nasty and racist. I belong to neither camp. Goodhart raises important questions. But his answers are unconvincing and his story of how we have got here implausible. Goodhart’s three key themes – the gap between the elite and the masses, the erosion of social solidarity, and the problems of multiculturalism – are all crucial issues to address. The trouble is, we cannot begin to address them until we stop being so obsessed by immigration. A shorter version of this review was published in the Independent, 20 April 2013. Even given the view that the obsession with immigration and the resulting policies are more of an issue than just diversity itself, I can’t help thinking that in-group identification must pay a role in the social outcomes of diversity. If something else doesn’t replace ethnicity and prominent arbitrary elements of common culture as markers of identity, don’t people tend to fall back on those? If so, maybe part of the challenge to diversity is creating broader commonality rather than assuming people will find it themselves? I agree with this. It is the erosion of broader and, in particular, more political notions of belonging that has led to the insistence that social affiliation can only be understood in cultural or ethnic terms. The issue, in other words, is one of politics, not of demography. But do you have any suggestion of what that political notion of belonging should consist of? That’s very well said: If you are for immigration you better be against mutlicutarlism, at least as ideology. But isn’t thinking in boxes very true also for many western societies beyond the question of ethnic diversity? There is regionalism (in UK, Spain, Italy), class culture, religious conflicts which are often increased by the political organization of these countries. Group identities were often given to immgrant groups because there were already “native” group who didn’t want to give up their group privileges. If protestants and roman catholics are treated a groups with their respective rights you also have to treat the muslims as a group. The self-proclamation as a “culture” can also be problematic, if a culture isn’t seen as a result inner and outer influences, as a “métissage”, but as an identity. Not only the term of multiculturalism but already the concept of culture is awkward. If we could be more diverse and inclusive then this would make multiculturalism a reality and not as stale as it appears sometimes to have become. Immigraton policies could then be more realistic in helping those seeking sanctuary to settle quickly and well without the fear of being evicted back to the horrendous conditions that they fled. It should be possible to achieve and would make the world a better place. A most impressive overview of the politics of immigration. And a much kinder review than the Economist gave Goodhart, which noted that his admirable concern for factual analysis continually subverted his polemical goals.